Clay Knight and Alex Schumacher, right, pose together prior to heading off to Richmond, Virginia for this week’s Brine National Lacrosse Classic. Coaches are tasked with finding and recruiting great players, but it’s up to the players to make sure they stand out in a crowd. 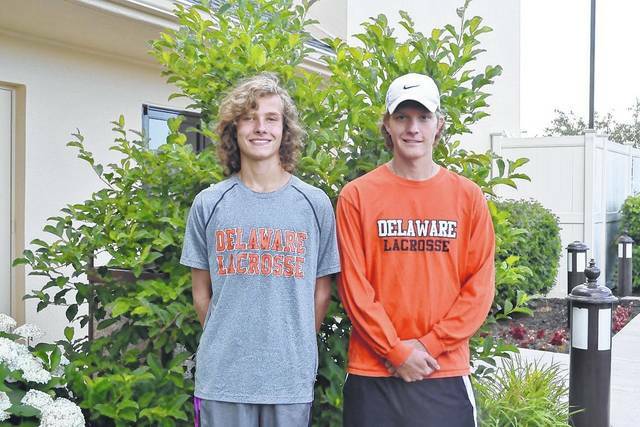 Two Delaware Hayes standouts earned the right to do just that this week – and already have to some extent – as senior Alex Schumacher and freshman Clay Knight, thanks to standout showings at regional tryouts, were named National Lacrosse All-Stars. The duo will represent Ohio at the Brine National Lacrosse Classic Tuesday-Friday at the River City Sportsplex in Richmond, Virginia. Schumacher said earning the right to play in the classic was a process, but one he powered through thanks to the work ethic he’s picked up from playing for the Pacers. For Schumacher, one of the best parts about being named an all-star is getting to play all-stars. Knight said he and Schumacher will play in a handful of games — each an opportunity to go against the country’s best players while getting instruction from the nation’s best collegiate coaches. The event brings the best youth lacrosse players in the United States and Canada to one venue. Regional teams, coached by NCAA lacrosse coaches, compete to become the national champion. Knight said he’s stayed sharp by playing throughout the summer. The Brine National Lacrosse Classic, in addition to the on-field action, gives student-athletes an opportunity to gain exposure to the college admissions and athletic recruitment process. For Schumacher and Knight, it all starts Tuesday.